I've designed the below GBC called Rainbow Wave. 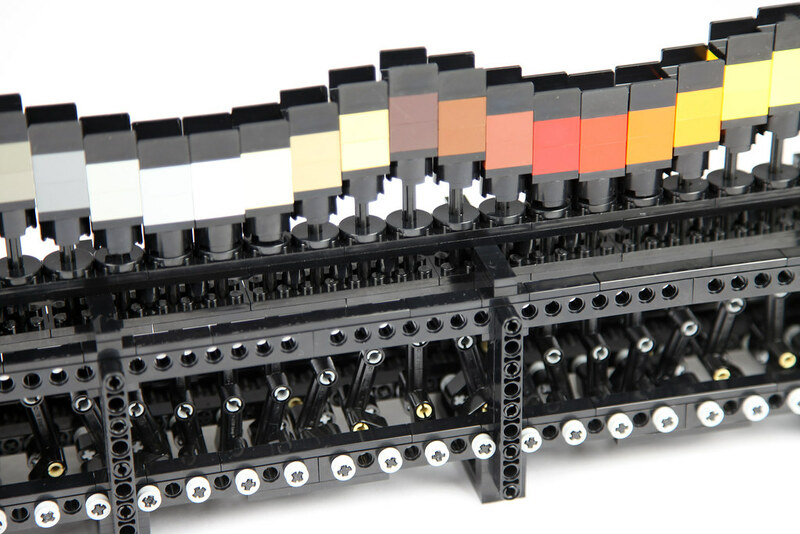 It has 38 Lego colors and about 1150 moving parts. It is powered by a single motor, with each of the colored pistons sitting on an 8-tooth gear. Each piston’s gear is exactly 1 tooth offset from its neighbors making one wave 8 colors. The GBC is level so the balls are moved by the waving surface. Free building instruction for version 2 and parts list is available on Rebrickable with a thank you @Courbet for the improvements and creating the digital model! These are the most detailed that I have but I can of course make more. That's fantastic! The Akiyuki inspiration definitely shows in the clean beauty of the model. Would be nice to have more detailed shots of the gearing including the motor as well as from top of the start. And some pictures from below. Maybe you could as well show how a single element looks like (I assume they're all the same) Thanks! The surface of the individual elements where the ball travels is just flat? This is one of the most amazing GBC modules. I am a technician (often working with signals) and hence looking at the spectral colours and the sine movement simply makes me feel happy. Wow. Just wow. That rainbow wave is just amazing to watch. The surface (where the balls travel) looks like panels (and maybe a 1x2 tile in between) to me? This is a fantastic module, and in many ways it is the most ‘Akiyuki’ of all non-Akiyuki GBC modules that I know of. Bravo ! 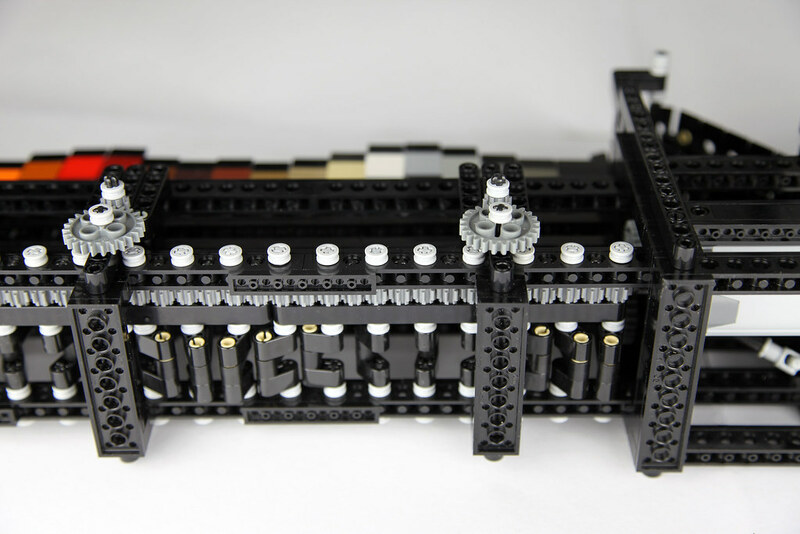 @Berthil, are you planning to release building instructions for your creation? 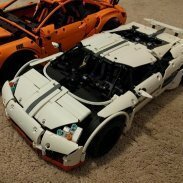 If not, I’m more than willing to have a try at it (if it’s ok for you), although, as tismabrick already said, some more pictures would be nice (input part and bottom view especially). That's right, 1x2 panels with round corners but no tile in the middle and no 2x2 plate. The colors are 2 x 2 so the panels fit nicely on that. The round corners are important otherwise a ball might stop. A ball that stops is no problem, the next ball will pick it up but with round corners no ball stops on the waves. That is really neat. Its a very hypnotic motion. Good job. Here a view from the bottom with 8-tooth gears that are 1 offset from the next. Of course there is one 8 tooth gear in between, a wave would not be possible without it. 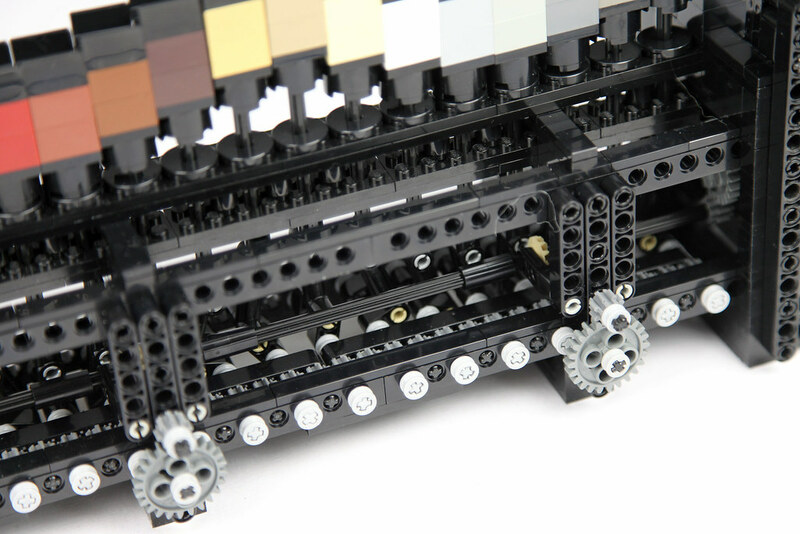 The 1x15 technic liftarms create a continues row to be able to put all 76 gears in line without interruption. Appreciate you posting this up. Placed a bricklink order today to see if I can build something similar. Thanks all for the positive feedback! Please let me know how I can help if you get stuck building one. - What is your reasoning for having two sets of technic plate guides between the cam shaft section and piston. The single double plates seems to keep the crankshafts aligned well vertically. Any possibility for a close-up of how these are supported from below? - Are all 8t gears on the bottom linked together? I was wondering if the gear lash differences doing this would cause more friction, rather than having 5 groups of 7/8/8/8/7 driven off the main shaft. - Any close-up of the mechanism that you used to induce the balls onto the lift? Very nice to see that you are making your own, good start! The cross 2 x 8 technic plates on top may work but that's not how I did that. I used 2 x 1 single stud plates on top and a 1 x 1 round plate on the bottom to keep cross beam 1 stud thin between the two layers of technic plates. I tried to keep all supports 1 stud thin and in line to have as much as possible an open view to the mechanism. So it may be more esthetic than a real need. Getting the balls onto the lift was the most difficult part of this GBC. The lower axle of the belt also lifts the bottom part slightly up with a thin liftarm to act as an agitator, otherwise the balls bridge before the 2 x 2,5 opening to the belt. I guess it's also possible to use another ball feeder like a stepper. As long as it's synchronized with the belt any solution should work. Just let me know if you need more help, I'll make pictures then. I supported your idea, fingers crossed! I think I will have to try recreating this as well! Again, it's an awesome creation. You are right about the construction but I wouldn't call it 'hanging', with the 1x1 round bricks in between where there is room it is a very rigid construction to minimise friction and/or prevent pistons sticking. I could hold the whole rail with double plate layers in my hand on one end without it bending much. The 'cross' beams of 1 stud just keeps it in place. Hope that helps. 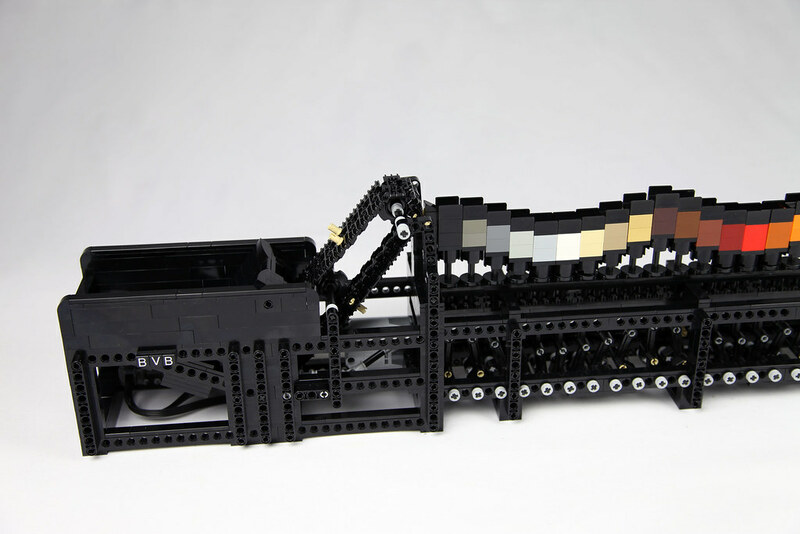 But may be BrianTG can comment on the use of 1 layer of technic plates if he tried that. I ended up having to redo it a couple of times to resolve friction issues with the quad plates. I had issues with misalignment of the plates vertically and laterally. I shifted the plate stack 2 studs from where it appears to be in the original to allow for more 1x1 round bricks between the pairs, and added 1x1 round plates and tiles to the parts elsewhere to keep it more contiguous, which seemed to fix the vertical issues. For the lateral movement, I found that when I first assembled it, the stack ended up with a bit of a curve in it, causing a lot of friction for the axles in a few spots. I had to take it apart and straighten it out on a flat table. Also had issues initially with some axles not being 100% straight. It spins easily now by hand. I received the wrong parts from my bricklink order for the 1x2x1 panels, without rounded edge, so need to reorder. Still trying to decide what to do before and after the wave, might figure out a way to integrate more closely with my ball factory moc. Looks like I'm going to be on Spanish TV with the Rainbow Wave. I've been invited to fly to Madrid in April and show it on the El Hormiguero 3.0 show, possibly as a technical sidekick. Doesn't matter, I would welcome the experience and good for promotion of GBC! Somehow I'm not getting emails when new posts are here. That looks very good Brian. I also had to replace about ten bended axles, it's a good testing machine for axles that are not straight. Courbet is making a very nice building instruction, I've send him some detailed pictures of the Inbox.